I have configured Security Groups, my tomcat is running in 8080 port. But I am unable to browse from web browser. Please anyone there to help me ? When I do curl http://localhost:8080 in EC2 instance then I can see the home page of tomcat, if I do curl 52.39.220.183:8080, then I get Failed to connect to 52.39.220.183 port 8080: Connection timed out. I have a couple of ideas. I can't say either are the real answer, but it should give you some ideas to try. First, your security group looks ok at first glance, though my web server security group doesn't have the security group like you have on your "all traffic" line entry. 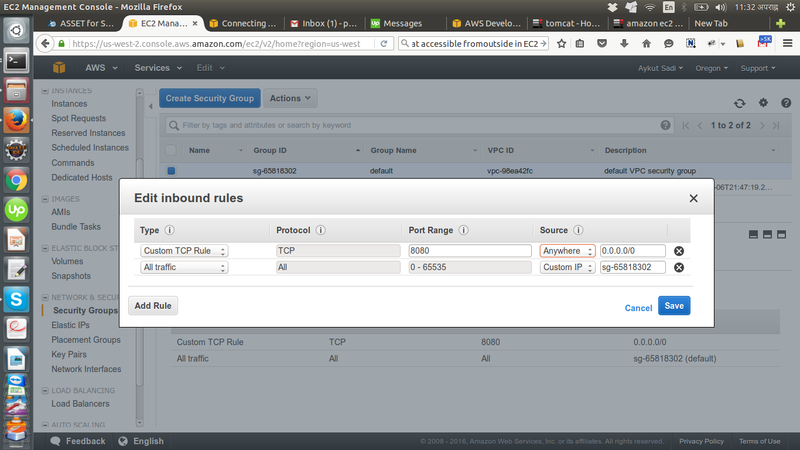 Have you set up a route table in your VPC? I go into this in my AWS/Wordpress tutorial, which you might like to read the start of for your security group/internet gateway setup. Second, I wonder if Tomcat is bound to localhost instead of the IP of the server (which is within the range of your VPC, found using the unix command "ip addres"). If it's bound to the wrong IP it may never get the request. Try changing that listen address of Tomcat. It was my mistake, the Instance was associated with another Security Group. First need to check the instance is taking which Security Group. Instance >> Network interfaces >> eth0 (Clicking on etho pop ups the box and at the bottom, it shows the associated Security Group). And of course we need to define Inbound request. Not the answer you're looking for? Browse other questions tagged amazon-ec2 firewall security-groups tomcat8 or ask your own question.